Today marks the launch of the inaugural Backyard Legend Day campaign, a community initiative that encourages Australians to volunteer to complete a household chore for someone who could really do with a bit of help around the house or yard: someone elderly, disabled, sick or injured, a single parent or a struggling family. Backyard Legend Day Ambassador, Mike Whitney, an Aussie legend himself, says he supports the campaign because it goes straight to the heart of Australia’s soul and our willingness to help other, less fortunate, members of the community. The most recent ABS data on volunteering shows that the rate of volunteering in Australia has declined for the first time in 20 years with the rate of people who have volunteered dropping from 36% to 31% over a four-year period1. These statistics, however, only account for formal volunteering through an organisation and do not include informal volunteering. Backyard Legend Day supporter, Victa, believes that if informal volunteering was included in the statistics, it would paint a different picture. As part of Backyard Legend Day, the search is on for Australia’s Backyard Legend, someone who has gone above and beyond to help out a neighbour or someone in their community. “If you know somebody who has helped out in the community in this fashion, this is a great opportunity to say ‘thanks’ and show your gratitude by nominating them and telling their story,” says Ms Clarke. There’s $10,000 worth of prizes to be won, thanks to Victa. 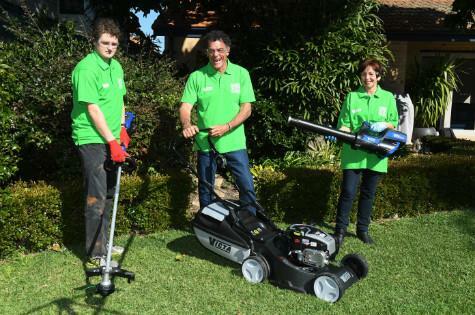 A bit of an Aussie backyard legend itself, Victa has been helping out in the back (and front) yards of with its iconic lawn mowers and other outdoor power equipment such as hedgers, trimmers and blowers. Backyard Legend Day is taking place on Sunday, 16 October. For more information, visit www.backyardlegendday.com.au. Or nominate someone who you think could be Australia’s Backyard Legend on our Facebook page (www.facebook.com/backyardlegendday).